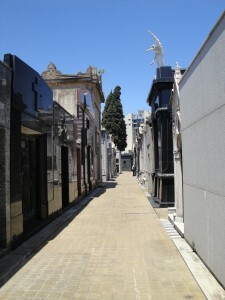 El Cementerio de la Recoleta ( Recoleta cemetery) is the final resting place for many of Argentina’s Presidents, Generals, Explorers, Heroes and a few somewhat more common people. 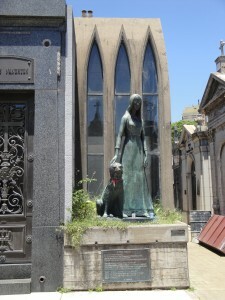 Although most people probably search out this cemetery because of Eva Peron being entombed here, for us it was not the most interesting aspect of our visit. With somewhere in the range of 4,800 mausoleums, the Recoleta cemetery is virtually a museum of fine architecture, sculptures and artwork. 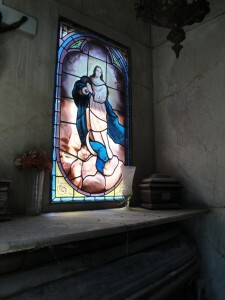 The mausoleums are a little hard to describe; the average size would be six feet square, a wrought iron door with glass to keep out the weather but allow some visibility inside, a small shrine inside to honor the family members entombed there and often a window or skylight of stained glass. What we found most interesting was that there was generally a very narrow staircase that led down below ground level where the remains actually rest. Hopefully, the photos will help illustrate our description. 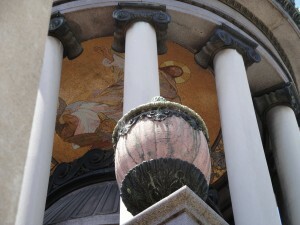 Many of the mausoleums are very ornate – including mosaics, bronze sculptures, stained glass windows and extensive use of marble. 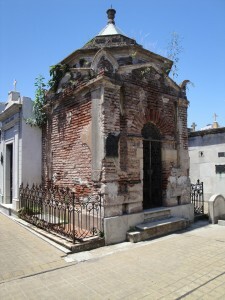 A note about Recoleta, and how the cemetery became “the place” to be buried (according to Wikipedia) – during the 1870s, following the epidemic of yellow fever which ravaged the city, many upper-class Buenos Aires residents fled San Telmo and Montserrat and moved to the northern part of the city, Recoleta. 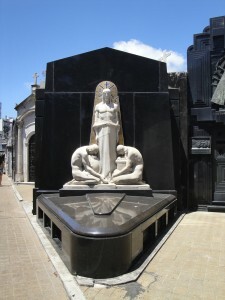 By becoming a high class neighborhood, the cemetery became the final resting place of the families of greatest prestige and power of Buenos Aires. Next to the Cementerio de la Recoleta is the Nuestra Señora del Pilar Church, a lovely 18th century colonial church, and the second oldest in Buenos Aires. The church houses an elaborate Baroque silver altarpiece. In addition, there was a beautiful nativity outside (of modern origin, unlike the interior). After the cemetery and church, we visited the Museo Nacional de Bellas Artes. It was a pretty impressive display of artists from Rembrandt to Gaugin. Plus, a fair number of Argentine artists – a lovely way to spend an hour, but it’s not the Musee du Louvre.